Like many Canadians born in the second half of the twentieth century, I spent a small but significant part of my childhood watching CBC-TV’s The Friendly Giant. As a preschooler, every weekday morning I was transfixed for fifteen minutes as Friendly invited us all to join him in his castle, chatted to his puppet buddies Rusty and Jerome, and read a book to us all. These days it’s difficult to imagine that any kid’s show could ever be focused around the reading of books. Reading a story with your friends – what a concept! Created by Wisconsin-born Bob Homme, who played Friendly, the show played in Canada for over twenty-five years and was marketed in parts of the US during the latter part of its run. The other regular occurrence on The Friendly Giant was Music Day, when Friendly would play recorder trios with Patty and Polly Piper, two other puppet friends of indeterminate species (raccoons, I thought, or maybe cats). 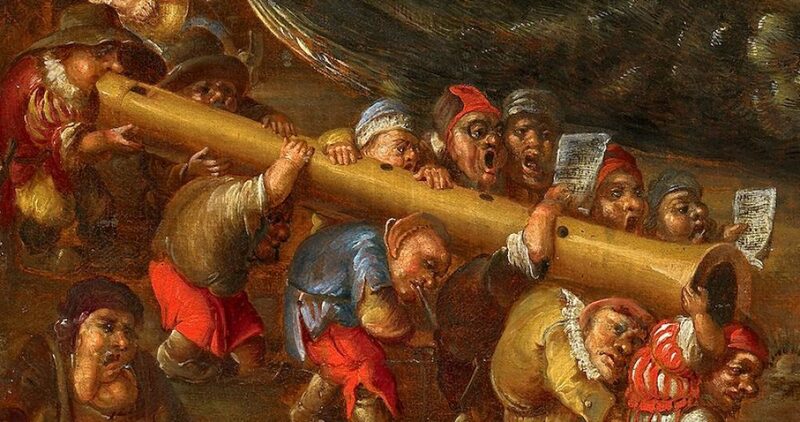 Once a week, with tiny toy recorders of various sizes, they tootled, bobbed and weaved to music from the courts of Henry VIII or Charles II, dance tunes published in the 1500s, and/or something penned by J.S. Bach. Go figure. You couldn’t get away with that on TV these days even if you paid for the privilege. Pre-school days ended and I abandoned Friendly for Yogi the Bear, Top of the Pops, Batman and the Addams Family (Carolyn Jones, may you rest in peace, you are still my hero). Then came high school, university, study overseas, and the return home to try making a living as a musician. I’d been doing that for a year or two when one day I got a call asking if I could come down to the CBC studios on Jarvis Street to play a session for an episode of [gasp] The Friendly Giant. The other people on the gig were my former teacher Hugh Orr, who had played on the show for years, and Bob Homme of course. I was over the moon – pretty close to where the cow flew in the show’s closing credits. At this time they were still recording all the show’s music in the TV studios, with the mics and music stands set up three feet away from where the show was shot. So when I walked into the studio and saw the set with the ‘real live’ Jerome the Giraffe puppet lying inert on the floor, the distant past collided with the present in a good way and I pretty much went into an altered state. There right in front of me were the castle walls, the window through which Jerome visited, the shoe bag where Rusty the Rooster lived, and the miniature living room into which viewers were invited, with its fireplace, rocker and the big armchair ‘for two of you to curl up in’…and there was Friendly himself. I remember making some Obvious Gig Novice comments such as ‘oh wow, look, those little chairs are so CUTE!’ and, ‘OMG was Jerome always orange and blue?’ but everyone seemed understanding of this, having had many other star-struck visitors on the set before me. Introductions were made, the session’s music was discussed, and then Bob, Hugh and I sat down and ran through a few Praetorius dances a couple of times while the tape rolled. (Jerome lay on the floor without moving.) And that was that. Luckily for me I was part of several more shows over the next few years. As time passed Patty and Polly expanded their musical skills, sometimes played different types of music on other instruments, and I think they underwent name and character changes at some point, but early music continued in the repertoire loop until the show ended. And that was pretty cool. Bob Homme was such a lovely man, unpretentious, laid back and kind, and he was an enthusiastic recorder player – he could always hold his own in consort music, and it was he who played the show’s theme song, Early One Morning. He was a clarinet player who grew up playing jazz, and a consummate professional with a real devotion to his work and a genuine respect for the intelligence of children. No dumbing down or talking two octaves higher for him. Playing for that show was one of the most pleasant and easy-going yet totally professional gigs I’ve ever had the good fortune to be involved in. Not surprisingly it’s also proven to be one the most meaningful career credits in my bio for people who happen to read it. Popular culture in general, and a direct connection to happy childhood memories in particular, trumps just about everything else from CDs on fancy labels to concerts in fancy places. Food for much thought there. The music wasn’t flashy, the technology wasn’t much, the audience was very young, but the impact of Bob Homme’s vision and inventiveness was far-reaching and powerful. He received the Order of Canada in 1998, two years before his death, and in 2005 the Audio-Visual Preservation Trust of Canada designated the show as a Masterwork. After the show ended a number of its puppets, props and costumes were put on display at the small museum in the CBC building down on Toronto’s Front Street. It was always fun to catch a glimpse of them whenever I was in the building. In 2007 most of the Friendly memorabilia was removed from the museum and a farewell afternoon reception was organized so people could drop by for a final look. Someone at the CBC called to ask if some recorder duets could be played throughout the event, and it was very touching to provide those with Colin Savage as people wandered in and out. There were a lot of visitors that day. 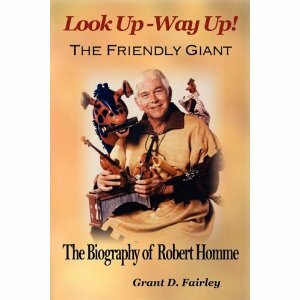 If you’re interested, check out Grant D. Fairley’s biography of Bob Homme, available through most book vendors. This entry was posted in Hall of Fame and tagged Bob Homme, CBC, Friendly Giant, recorder by Alison. Bookmark the permalink. Thanks for reading it, Marg! I am 56 and I grew up in Presque Isle, Maine, close to the Canadian border. One of the 4 channels we could pick up off – the – air, CBC, broadcasted The Friendly Giant. It was a morning ritual and the opening theme and hearth scene was so gentle and comforting. I showed the youtube videos to my three children 6, 10, and 12 and they were glued to the screen. The love music, puppets, and miniature things. I’ll try to get hold of the biography. Thanks for the post.